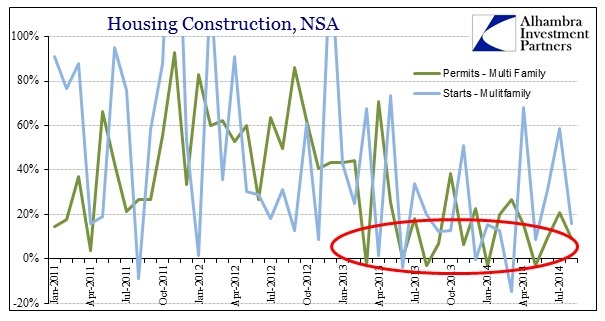 Another month, another instance where supposed “tight” supply and high home prices fail to register any significant change in home construction. 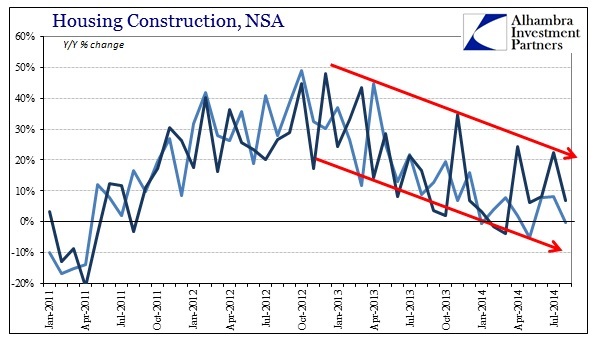 Construction figures for August bear little resemblance to the idea that anything other than monetary interference is responsible for the mini-bubble in activity. Further, August represents another month’s worth of confirmation, despite any and all volatility in the data series, the mini-bubble will continue to be spoken about in the past tense. As usual, the month-to-month variation is wide, made more so by “regular” revisions to both June and July. June’s figures were, on the whole, revised much lower while July saw some upward notice. In the end analysis, such is irrelevant because the trends are still as durable as ever; nary an inflection to be found. It is single family homes that are most pertinent to broader economic factors, though we should not discount any surge in construction from apartment activity (unfortunately, there remains none). 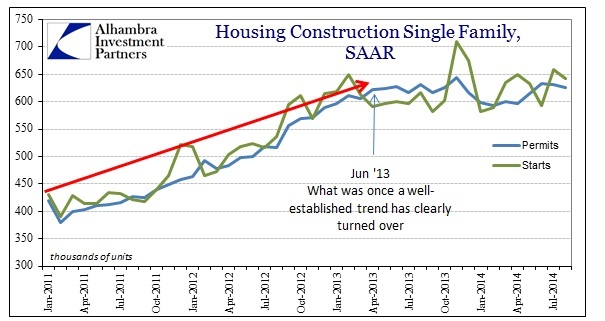 The pace of construction in the single family segment continues to not only underwhelm expectations of a rebound (with the weather), but is still pointing in the “wrong” direction (in monetary terms; in actual supply and demand activity is reflecting nothing more than past imbalances never allowed to clear). Where it looked like perhaps permit activity in June would portend at least the possibility of an actual rebound, that has been erased instead as the trend continues in its downward channel. That result, as long as it holds from further future revisions, was simply the net effect of too much noise; the trend is all that matters. Part of the excuse offered to “explain” this disparity in home construction is tight credit conditions. That is undoubtedly a very real dynamic, especially compared to the pre-crisis period, but it should end there. 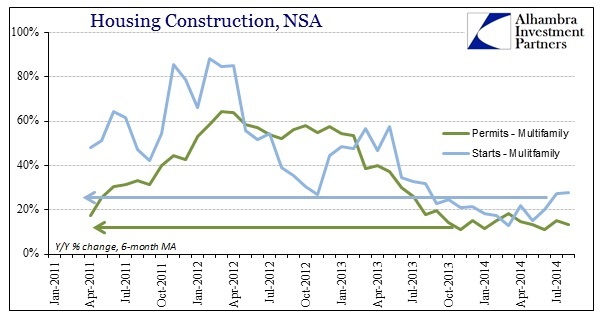 Assuming that tight credit was the most powerful factor in holding back single family home construction from “joining the recovery”, then there should be a more robust and sustainable expansion in apartments. That there isn’t, at least that it never survived the middle of 2013, is evidence that mortgage credit is not the overriding “problem” in real estate. 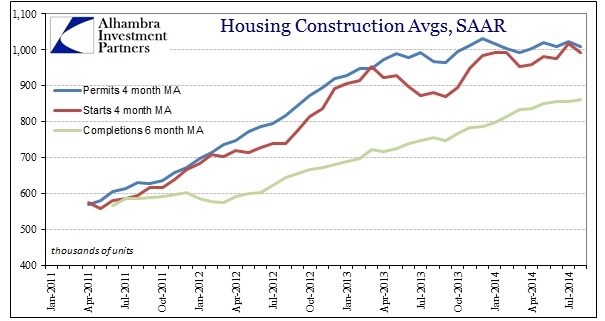 Again, the timing of the slowdown in apartment construction alongside household formation speaks very clearly about the lack of income and real growth. 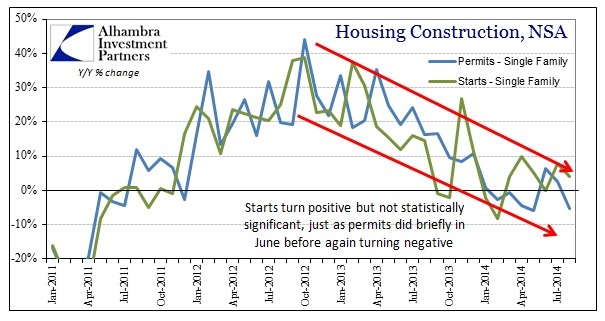 Instead of weak credit “pushing” the assumed “surge” in otherwise profoundly optimistic new employees into at least new apartments, instead there is no rush to either new homes or apartments in 2014, more than suggesting they have no wherewithal to do much of anything toward further economic expansion downstream.